This regal double wrappe19"d pendant of rhodochrosite gemstone is truly one of a kind. 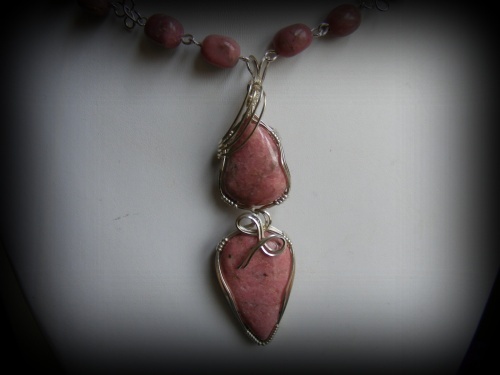 Wrapped in sterling silver curls, this piece has matching rhodocrosite gemstone beads for the neckpart. A magnetic sterling silver clasp is added to this piece making it so much easier to put on. Piece measures 19" long and comes with matching earrings.